Two weeks has passed since Hurricane Harvey hammered the Texas gulf coast. Since then Houston has flooded and as I write Florida is being smashed by Hurricane Irma. So what, if anything have Government to Business websites in the United States learnt since my first assessment of their digital performance? That's a lot of jobs potentially gone. Not only is it imperative to the President's political future to solve the federal disaster aid mess for business, it's also essential to impacted business owners and the people they employ. When initially looking at the business customer experience, all these sites previously scored poorly. But with two weeks passing they have all lifted their results but can still improve a great deal. FEMA.gov now highlights recovery information for Hurricane Harvey and disaster preparedness of Irma. The information for Irma links off to https://www.ready.gov/hurricanes. While that information is broadly about safeguarding your home rather than your business, the principles are the same. In particularly there are two easy to understand infographics on clearing away flood damaged items and the process for applying for funding assistance. There are also a number of really useful fact sheets that could be printed and disseminated on the ground about cleaning mould, debris removal and electrical safety. The one prevailing issue that still exists from a business customer's perspective is making their way through the morass of citizen information. One aspect that is very confusing is the nature of disaster loans from the Small Business Administration. You would expect that the loans would be targeted to small businesses. But when FEMA's pages also discuss applying to the SBA for funding assistance if you are a land owner or renter a house or apartment it becomes very confusing. The New York Times had an excellent example of this where FEMA was encouraging Jamie Moyer, a private citizen with no business, to apply to the SBA, causing a world of confusion for Mrs Moyer. FEMA has improved some apsects of its online experience for those impacted by disaster, or about to be. That said, the mish-mash of citizen information and services drowning out targeted business information is disappointing. A "lessons learnt" review in early 2018 is essential to pull FEMA up a further grade level. FEMA's little brother site, DisasterAssistance.gov, how at least has a focus on both Harvey and Irma. I could not believe two weeks ago when Harvey wasn't even mentioned on its homepage despite federal assistance being declared by President Trump. They now have some prominent links, but with them going to pages about volunteering and a mountain of citizen information on USA.gov (but not a single mention about business recovery and support), this is again a poor customer experience for business owners. 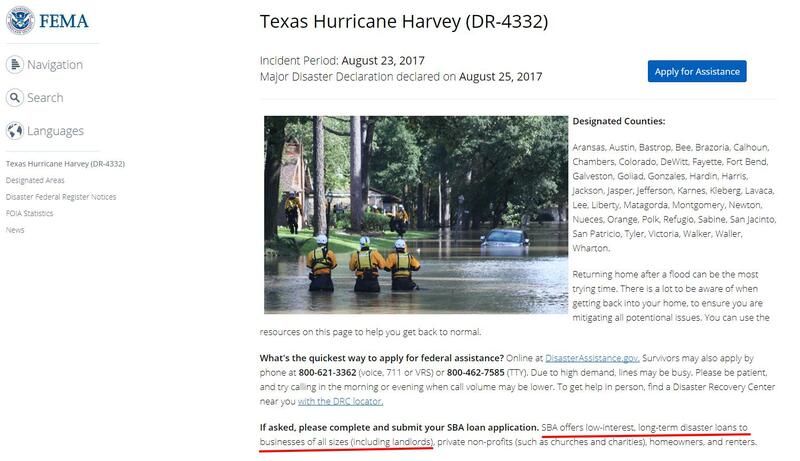 If you now search DisasterAssistance.gov for information about disaster recovery based on an address in a Hurricane Harvey declared location, it links you to FEMA's information. While that's great in better coordinating messaging, as it is the same information mentioned above that generally ignores business, it isn't helpful for disaster affected businesses. The remainder of the DisasterAssistance site hasn't changed. And with its confusing experience for businesses, that's not a good thing. The business customer experience is still confusing and haphazard. At least the homepage acknowledges the latest disasters and provides better access to information elsewhere. But there is a LOT that can be improved for businesses with DisasterAssistance. The Small Business Administration has managed to ever so slightly tweak their homepage to provide a link to Hurricane Harvey information. That said the call to action is very underwhelming: "2017 Hurricane Recovery: you may be eligible for an SBA loan deferment." 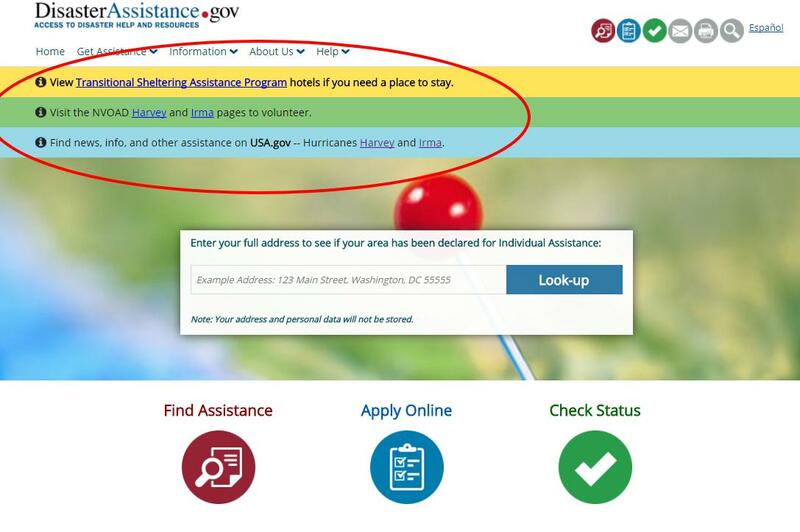 On this page, the heading "Disaster assistance" and call to action button "Apply for assistance" are excellent. They take you through to the rather ordinary Disaster Loan Assistance site which I discussed two weeks ago. But at least its clear where the link will take you. Back to SBA's main disaster landing page, this also does a great job of quickly showing what you can use disaster loans for. It touches on that confusing point that the Small Business Administration provides loans not just to businesses but individuals as well. But again it skirts around this anomaly and doesn't explain why. Of all the government sites, SBA.gov has improved the most in two short weeks. A number of key aspects are much clearer, but some areas still need addressing. Fundamentally the Disaster Loan Assistance site needs the greatest work. Looking at its operation it appears this will require considerable time and effort to replace. I think SBA can achieve this. The way they radically upgraded their main site with clear, simple targeted disaster recovery information shows they can delivery. Come summer 2018 they'll need to have done so. The US Department of Agriculture was the stand out when I initially analysed US government websites to business following Hurricane Harvey. With everyone else improving their offering to business I was expecting the same from the USDA. But it felt like it was stuck in a holding pattern. A few more radio stories and an updated Twitter feed about Harvey and Irma, but everything else was pretty much the same. There is a surprisingly good link to USDA disaster recovery information and services buried under the title "Rural Development Disaster Assistance" but no support content to provide context is given. That page actually contains four disaster recovery programs for businesses, but you'd never know based on the preceding page. On second glance, the lack of disaster preparedness for farmers and other agricultural businesses facing Hurricane Irma was a significant concern. USDA have slipped. Fast out of blocks, but now complacent. They have shown they can be focused on agricultural businesses facing disasters. They need to return to their normal high-performing selves. But when you follow the link for "Flood warning and relief efforts" it takes you to exactly the same page that existed two weeks ago. And when I say exactly the same page, I mean exactly. Not a thing had changed. It was not useful then, and its even worse now. This "Texas Emergency Preparedness" page is still written in the context of getting ready for Harvey. It is incredibly out of date and has zero information for affected businesses in Texas. I don't think its possible to give a grade lower than an F. But I have to. Texas.gov's efforts in supporting disaster affected businesses in their state is terrible and a case study for any government on what to avoid. The only reason I can imagine that things haven't changed is literally the team members looking after the website are personally impacted by the disaster. The offices of Texas.gov may also be affected. That has to be the only reason. But in contemporary government you have business continuity plans that kick in when a disaster like Harvey occurs. If they don't have such contingency measures in place than a F minus is an appropriate grade. Can Florida do any better? In some ways yes, but others, no. For starters Florida's government presence online is stuck in the 2003. And I am literally not joking. Here is the official Florida government portal homepage from 2013 and then the day Hurricane Irma hit its coast. Good luck spotting the difference! But that's not the end of it. Try finding any information on the official portal to anything to do with Hurricane Irma. 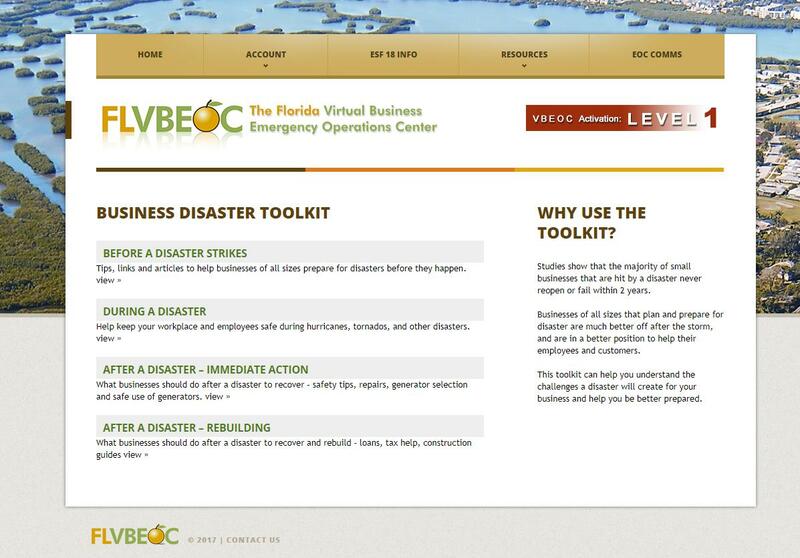 So while the customer journey trying to find useful disaster preparedness information for businesses from Florida's web presence wasn't easy, the result was eventually positive. The over all experience from Florida was like pulling teeth. Not something you want to put a busy business owner through as they're trying to get ready for a hurricane! But Florida ended up delivering the goods on the content front. This helped it scrape into a conceded pass. But the overall Florida state government digital strategy for business needs a major renewal. If they can do that well, they have the potential to be a leader in this space. 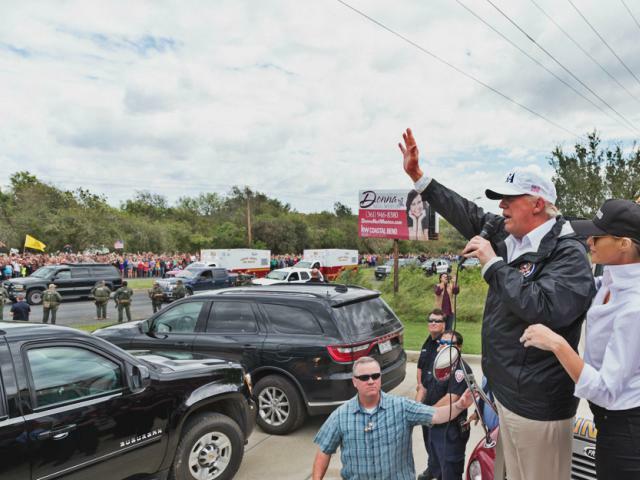 It is too late in the current Hurricane season for President Trump to change the byzantine complexities of federal disaster aid and information provision for citizens and businesses. But it must be a priority before summer 2018. The trouble here will be getting the balance right in agency responsibilities and accountabilities. His business world experience can really make a difference here. Yes, it is citizens who will vote again for their president in 2020, but one critical element to all that is job creation. Trump knows the engine room for job creation is business. If he's to turn those FEMA business resilience statistics around, massive changes need to be made to before the next disaster on America's doorstep. Just remember those FEMA business recovery statistics. There's still time for action. But it is well overdue.